Offers valid on 17/12/18 at mentioned venues only. Cafe Di Stazi offer valid $2 hot drinks from 6am to 4pm only. Silverbeet offer valid 20% off breakfast from 5.30am to 11am only. Real Peas offer valid $2 hot drinks from 6.30am to 6.30pm only. Oconnell Street Cafe valid $2 hot drinks from 7am to 3pm only. Cup n Chino offer valid $2 hot drinks from 10am to 4pm only. Perpetual Espresso Bar offer valid $2 hot drinks from 7am to 3pm only. 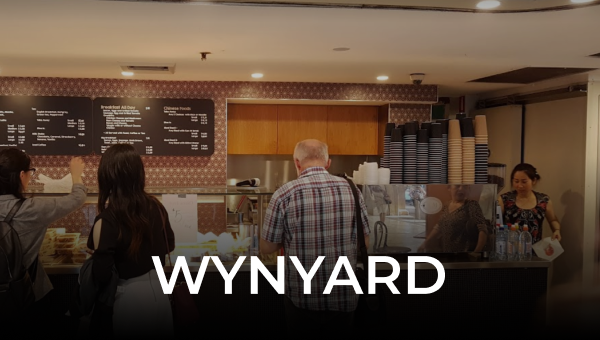 Toby’s Estate Westfield and Toby’s Estate Darling Square offers valid $2.50 hot drinks from 2.30pm to 4pm only. Some hot drinks may be excluded. Base price discount capped at $5. Excludes modifiers. Cannot be used in conjunction with other promotions. All subject to availability. Offering may differ from images. Discounts will appear on checkout screen. Offers valid on 18/12/18 at mentioned venues only. Scoota Cafe offer valid $2 hot drinks from 6am to 10pm only. Piccolo Me offer valid $2 hot drinks from 7am to 4pm only. Mo’st offer valid $2 hot drinks from 8am to 4pm only. Radley’s offer valid $2 hot drinks from 8am to 11am only. Banh and Butter offer valid $2 hot drinks from 7.30am to 2pm only. Kikko Cafe offer valid $2 hot drinks from 2am to 4pm only. Perpetual Espresso Bar offer valid $2 hot drinks from 7am to 3pm only. Toby’s Estate Westfield and Toby’s Estate Darling Square offers valid $2.50 hot drinks from 2.30pm to 4pm only. Some hot drinks may be excluded. Base price discount capped at $5. Excludes modifiers. Cannot be used in conjunction with other promotions. All subject to availability. Offering may differ from images. Discounts will appear on checkout screen. Offers valid on 19/12/18 at mentioned venues only. Nashi offer valid $2 hot drinks from 6am to 12pm only. Oconnell Street Cafe offer valid $2 hot drinks from 7am to 3pm only. Radley’s offer valid $2 hot drinks from 8am to 11am only. Perpetual Espresso Bar offer valid $2 hot drinks from 7am to 3pm only. Cup n Chino offer valid $2 hot drinks from 10am to 4pm only. Toby’s Estate Westfield and Toby’s Estate Darling Square offers valid $2.50 hot drinks from 2.30pm to 4pm only. Some hot drinks may be excluded. Base price discount capped at $5. Excludes modifiers. Cannot be used in conjunction with other promotions. All subject to availability. Offering may differ from images. Discounts will appear on checkout screen. Offers valid on 20/12/18 at mentioned venues only. Banh & Butter offer valid $2 hot drinks from 7.30am to 2pm only. Kiko Cafe offer valid $2 hot drinks from 2pm to 4pm only. Radley’s offer valid $2 hot drinks from 8am to 11am only. Toby’s Estate Westfield and Toby’s Estate Darling Square offers valid $2.50 hot drinks from 2.30pm to 4pm only. Some hot drinks may be excluded. Base price discount capped at $5. Excludes modifiers. Cannot be used in conjunction with other promotions. All subject to availability. Offering may differ from images. Discounts will appear on checkout screen. Offers valid on 21/12/18 at mentioned venues only. Nashi offer valid for $2 hot drinks from 6am to 12pm only. Real Peas offer valid for $2 hot drinks from 6:30am to 4:30pm only. Radley’s offer valid for $2 hot drinks from 8am to 11am only. Toby’s Estate Westfield and Toby’s Estate Darling Square offers valid $2.50 hot drinks from 2.30pm to 4pm only. Base price discount capped at $5. Excludes modifiers. Some hot drinks may be excluded. Bings offer valid 20% off breakfast from 8am to 11am only. Cannot be used in conjunction with other promotions. All subject to availability. Offering may differ from images. Discounts will appear on checkout screen.